Back in the late 1970s, the USAF and other services were deciding that high color markings on an aircraft were not what was wanted so embarked upon spending our tax money on coming up with something different. This resulted not only in the now-familiar grey paint schemes, but a rather wide variety of different insignia before something was decided upon. 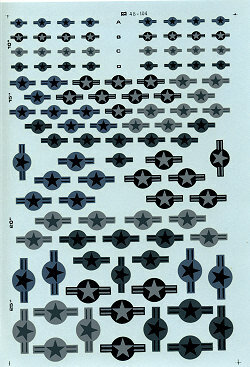 This sheet has insignia that were used on F-16 and F-5E aircraft (according to the instruction sheet). Style B was 36375 and 36118 for the F-16 lower wing. Style D was 36118 and 36321, also for the F-5E. These came in 10, 15, 20, and 25 inch sizes. I'm sure these would fit other aircraft as appropriate. Thanks to me and the dwindling decal dungeon for this one. If you would like your product reviewed fairly and quickly by a site that has over 350,000 visits a month, please contact me or see other details in the Note to Contributors.